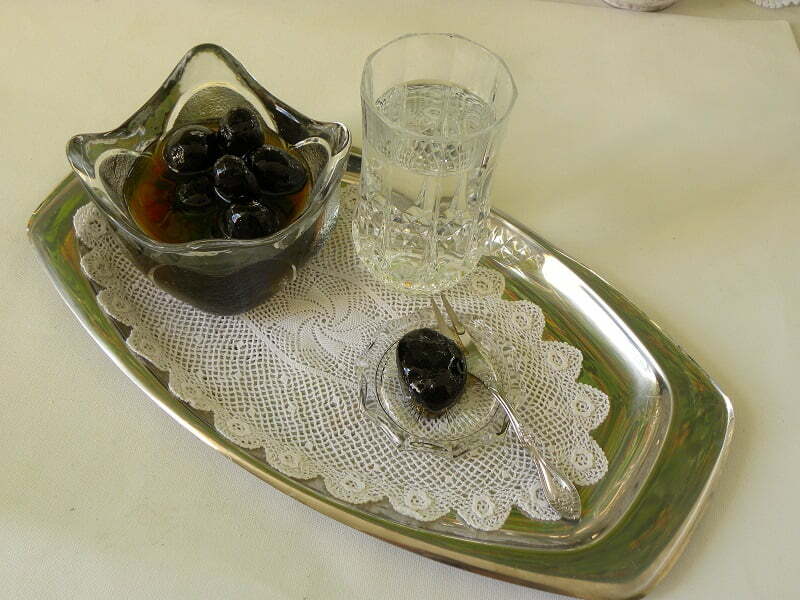 Karydaki, which means small (or young) walnut, is one of the best Greek traditional spoon sweets. The spoon sweet is made with baby green walnuts in Spring, when the outer shell has not become hard. The procedure for making it is a bit labour intensive but it is worth while. Use the tenderest ones you can find, the older they are the harder they tend to be. They are best picked when they just come out. Fresh walnuts are very bitter, so the procedure of changing water for many times and days is to remove this bitterness as much as possible. During the preparation process they turn black but that’s how they should be. As for most spoon sweets the fruit is soaked in pickling lime (asvesti) which helps them stay crunchy. When my mother used to make spoon sweets and her mother before, they used to go to constructions and get some quick lime but you can find some in your local supermarkets or you can get some lime on the internet. I want to say here that it is better to use pickling lime but if you can’t find any you can still make the preserve but it won’t be very crunchy. Thinly Peel outer skin of the walnuts but you should wear gloves otherwise your hands will go black. It takes a few days for the dye to wash off. Take a skewer or a knitting needle and prick the walnuts, horizontally and vertically. Wash each one separately and place them in a basin with water. Leave them in a sunny place for six days changing the water twice a day. Put some pickling lime (‘asvesti’) – in a muslin cloth and place in the basin with the walnuts and let them soak for 5-6 hours. This is optional but it helps to keep the walnuts firm. Wash the walnuts thoroughly and put them into a large saucepan with plenty of water to cover them. Boil for 2 – 3 minutes and strain. Add cold water. Make a slit on the top and insert a blanched and roasted almond inside. Boil again for 2 -3 minutes, and again drain and put cold water. Boil for a third time until soft. To know if the walnuts are ready, you should make the needle test. Take a skewer or a needle and prick the walnuts, if the needle passes through the walnut then the walnuts are ready for the final process and syrup. Remove from the saucepan and put into a large bowl of cold water and add the lemon juice. Leave in the water for 1 hour, this will make them crunchy and shiny. Change the water and place in a clean saucepan and cover with sugar and the water* (see above) and boil for 3 -4 minutes. Remove from heat. Repeat this boiling procedure 8 times (twice a day) and by the end the syrup will thicken. During the 8th time add the cinnamon stick, the cloves and boil until syrup thickens. Add the remaining lemon juice. At no time should you put the lid on the saucepan during the whole procedure.. Allow to cool in the saucepan then store in clean and dry sterilized jars. How can we tell if the syrup is ready?